This party game is hilarious to watch, and even more fun to be part of! It's cool for a sleepover party, it works nicely for Christmas, Thanksgiving and for family events. It's also getting rated highly, so you'll find it goes down well. Put the gift in a box and wrap it tightly in at least 15 layers of wrapping paper, with plenty of tape. Make sure it is a gift that can be manhandled and is not fragile. 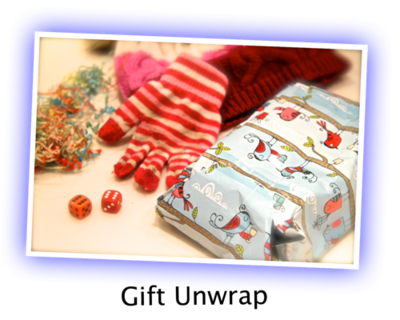 The gift is placed in the middle of a table along with the mittens, scarf, hat and dice. Now start the game. Each person takes a turn at rolling the dice. As soon as someone scores a double they must pass the dice on and then put on the mittens, scarf and hat as fast as possible. Then they must scramble to unwrap the present, whilst still wearing the mittens. The whole time this is happening, the other players keep rolling the dice until one of them gets a double. They then take the mittens and clothing from the other player and have a turn at unwrapping the gift. We've played this for years using a big thick Hershey's candy bar- everyone loves it! This game is absolutely a hoot; played with teens or adults. It's actually funnier with adults. OMG thank you lol i used 2 play this game all the time in girl scotts and i 4got about it its sooo funn im gonna play it at my pool party this year thank you so muchh!!!! i once did it with choc and i got to eat 3/4 of the mas bar every one elce hardly got any!!!!!!! we played this at my friends party, and it was really fun! Played the chocolate one before and although lots of fun, can b frustrating when your just about to eat the chocolate and someone gets a double!!!! it seems like a great game and a hard game but i will give it a shot at my party!!! i love it its a cool idea!! Cool. You can put like a party favor in the box or play the game lots of times w/ more than 1 gift. This game was really fun its a good "hurry hurry the presents mine" type of game so other people should play it. I loved this game it was so funny and so cool it was great!!!!!!!!!!! !